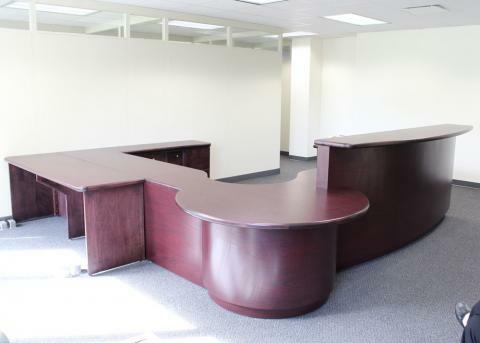 We custom design and manufacture reception and circulation desks to meet the customer need based on the space available. We have a number of comfortable chairs to choose from such as the Khroma or Breathe among others. Our custom circulation or reception desks can include power strips for various electronic devices and Tuck LED lights per customer request. Further customization includes your choice of wood type, oak or birch, wood stain, laminate, edge profile and hardware. Request a sample of your favorite options, a quote or estimated delivery date by contacting your CSI sales representative. You may also choose built-in cabinets to keep files, pencil drawers or even keyboard drawers. Additional products to consider include a credenza, or filing cabinets. Your CSI Sales Representative can make a free onsite visit throughout Nebraska which allows to measure the space, discuss specifics and provide you with a detailed layout of the space and a detailed drawing (see below) of the desk. CSI prices include delivery and set up throughout Nebraska.